Multifuctional phone watch: GPS positioning, GPS assisted positioning, LBS base station location, remote monitor, emergency call, two-way conversation (call and answer call), remote alarm, security fence, etc. 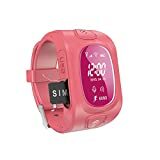 GPS +LBS (Base station positioning): Dual mode positioning means double safety for kids. Achieve all day real-time location tracing, check the position at anytime anywhere. You can track the location via SMS, website, iOS or Android APP. Uses Mirco SIM card. Kids could communicate with their families freely through family numbers.